Indian sailor begs for water after his ship was sunk in the Indian Ocean. This photo was taken by photographer Frank "Pappy" Noel. Noel was in Singapore at the time of the Japanese attack and is able to board a British vessel, S. S. Jalarajan (5,102 tons displacement) of the Scindia Steam Navigation Company which leaves for Calcutta, India. About 270 miles (434.5 kilometers) west of Sumatra, the ship was attacked by Imperial Japanese Navy submarine I-65 (later I-165). Five crewmembers were killed. Noel and the others take to lifeboats, where they drift for five days. Two days after the sinking his lifeboat encountered another lifeboat, also victims of the Japanese. The men asked for water but Noel's boat had none. The men were rescued and taken to Sumatra and Noel was able to get out before the Japanese captured the island. He won the Pulitzer Prize for photography in 1943 for this image. 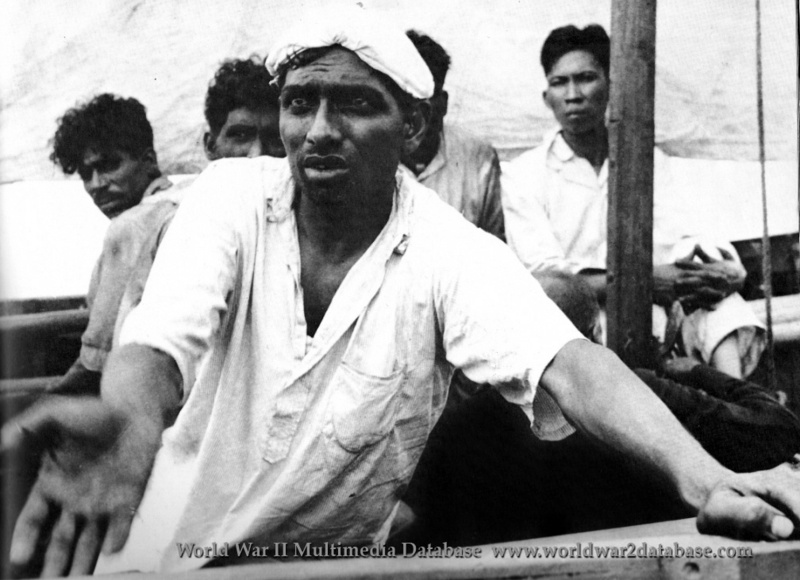 Thousands of men, women and children in hundreds of cargo ships and small craft sought to escape the advancing Japanese, fleeing from Java, Sumatra and Singapore. Japanese submarines, surface ships and aircraft sank many of them. Historical research reconstructing the transits and losses of these vessels is ongoing; many of the ships were lost with no record of their transit. Bodies washed up, one as far away as Christmas Island. Other Allied soldiers and civilians who survived being sunk were captured as prisoners of war or executed by the Japanese.